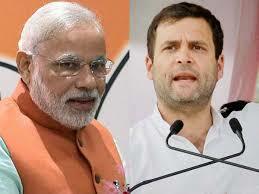 Oath Charts Of Narinder Modi & Rahul Gandhi: What They Foretell ? Let us study the Oath taking chart of Narinder Modi of 26th May 2014 18-11 hrs. Nakshatra Bharini 1st Pada and Narinder Modi has Moon in Scorpio 9.34 degrees and 3rd pada of Anuradha , hence till 3rd Pada of Bharini it is Sampat Tara . Bharini Tara is Ugra and Kroora and not good for Oath Taking Chart . It is only good for aggressive acts like killing , cheating , works involving fire etc. The Luck Factor and Fate is seen from Nakshatra. moon and Nakkshatra Lord both are well placed from the 9th house, 9th Lord , 10th house 10th Lord, but a malefic nakshatra for the Oath Ceremony, hence The Luck factor may not help him with strength. Karna Vanija it is a movable Karna and connected to the 10th house/Lord Lagnesh, Karyesh is good. The Lord of Karna is Venus and connected to Moon the 10th lord but there is also Ketu who is Friendly to both Moon and Ketu but Venus is not Friendly to Moon and since both are conjunct in the Sign of Mars and Mars is not Friendly to Moon and these planets Placed in the 7th house of Oppositions shows the performance will be adversely opposed by the opposition Parties . Narinder Modi may not be able to Perform Properly since Venus the Lagna Lord and the 10th Lord are not Friendly. Karna Lord connected to the 10th Lord in the 7th house of oppositions hence Narinder Modi has to take the Opposition Parties in confidence else he will have hurdles at every stage to Full fill his Promises. Karya siddhi entirely depends upon this feature in the chart. Yoga Shobhana Lord is Sun and Placed in the 8th house . Sun is neither placed well from the 6th Lord nor Ketu hence Narinder modi has to Keep a Track on his health issues also . Hora of Sun The Horesh and Varesh are Neutral. Hora of Sun generally offers obstacles, hinderances and failures to achieve the results, but good for the significations of the planet. Horesh is placed in the 8th house and 2/12 position with Varesh Moon. They are not placed well from each other. Uday Lagna is in Amrit Bhaga at 29.13 in Vishaka nakshatra , but Avyogi planet Saturn in the Lagna is also a strong Negative in the chart when it is extremely close to MEP. The Positives are influenced adversely. Saturn should not be connected to the Lagna, Lagna Lord, Moon, Moon Lord and Moon should not be connected to 8th house /lord . Now in the Chart lagna , Lagna Lord both along with Moon are connected to Saturn and that also Retrograde, but being a Yogkarka will be good, but not as in retrogression and there may have to be repeated efforts to complete the task with lot of Hurdles and Resistence from the oppositions . Arudha Lagna is again Libra and the same effects as above. Having Malefics in both Uday and Arudha Lagna is not good for fructification of the Muhurat chart. Both are aspected by 5th aspect of Jupiter is definitely a saving but Jupiter aspect will only be 50% influence only. Aspect of Venus on the Uday and Arudha Lagna is also good, Venus will cast 100% effect , Hence mixed results. Placement of malefics in any case is not good in these signs . Chaitra Rashi is Aries and having Ketu is not good at all, more so since Aries sign is Prishtodayo, Shastra says such a Muhurat should be avoided at all costs since Chaitra Rashi is Future and hidden things sprouting unexpectedly. Even the Positives Uday lagna , Arudha Lagna and Chaitra Rashi are in 1/7 axis along with Moon are adversely influenced since All the 4 Parameters vital for the Muhurat are in Rahu-Ketu axis. Chaitra Rashi has only one Benefic Venus and KP Moon , hence there will be lot of things which will take a very important dimension all of a sudden and untoward happenings again and again . More So since Mars also aspects the Chaitra Rashi Aries , Prishtodayo Sign during the day and aspected by Prishtodayo Saturn and Mars is extremely bad more so since it has Ketu, hence untoward happenings during the future specially when Saturn is in Scorpio sign till 28th Jan 2017. Mars and Saturn in Scorpio after 20th Feb. 2016 since the 8th from Chaitra sign will be most sensative in the future. Saturn ingressed in Scorpio sign in Nov 2014 the sign of the Day Lord at the time of Oathtaking as per the Yama chart hence there will be maximum Troubles to the Modi Govt. till Saturn is there in Scorpio and specially when Mars Joins Scorpio on the 20th Feb 2016 and Mars remains there for 211 days in which Mars will also be in Fallen Stage in the Libra Lagna from 17th June 2016 to 12th July 2016 will be the most crucial period For Narinder Modi Govt. Saturn was Stationary 5 days before and 5 days after 14th March 2015 when it was Stationary at 10.56 degrees and aspected Sun at 11.08 degrees in the 8th house with 100 % aspect . Sun is the Most royal planet in the chart and has to be placed well. Placed in the 8th house and aspected by Stationary Saturn on the 14th March will definitely bring Strong results, Specially near the Eclipses on the 13th and the 28th Sept. 2015 There will be agitations , Terrorism, and Tug of War and Oppositions from the Other political parties Saturn will reach these Degrees of Retrogression on the 8th Nov. 2015 and 27-28th Nov. 2015 when Saturn will be conjunct in Scorpio with Sun in Transit and both at same Degrees aspecting the Sun in the 8th house. Failures . Sun should not be ill placed along with moon since they are life giving Planets and Saturn a Planet of Destruction. DBA Planets are Ven-Ven-Rahu, For successful oath taking the DBA should be connected to 2.6,10 houses here it is the lagna Lord and the 8th house and Rahu Dispositor also Venus are surely negatives and specially the Dasha Venus-Sun from 11-4 2016 of the chart. Rahu was in Forward motion till 25th May 2014. Jupiter and Mercury placed in the 9th house is good but Jupiter aspect on the lagna gives only 50 % aspect and specially the 5th aspect is not very powerful. . Both Placed in the 9th house make it strong. The strength of the Uday Lagna and the Arudha Lagna is 485 and Chaitra Rashi is 343, Hence The UdayLagna and Arudha Lagna are stronger then the Chaitra Rashi and since aspected By Jupiter and Venus is a saving in the Muhurat Chart , more so Jupiter is at the MEP of the Lagna will give him Protection . Saturn though a Malefic it is Yoga Karka for Libra and also near the MEP hence , inspite of Hurdles and obstacles and oppositions , Narendra Modi may complete its full term of 5 years , since the Day Lord Moon is not ill placed from the 8th Lord and the 10th house . The Karna Lord and the 10th Lord together is another parameter in the chart which will give Full Tenure . Rahul Gandhi was sworn in as the 16th President of the Congress party on Saturday. Gandhi took over the reins of the grand old party from his mother, Sonia Gandhi, who had been at the helm of party affairs for nearly two decades now. Placement of Mercury as the Lord of the 8th house and also the 8th Lord from the 10th house and its placement in the 10th house with Debilitated Moon spoils the significations of the 10th house and the native may adopt all ways and means to reach his motives by hook or crook. The decision for his becoming the Congress President was announced on the 11th Dec. 2017 the day when Mercury attained the status of a Fallen Planet and I have explained the status of a Fallen Planet Mercury owning the 6th house of the natural zodiac and falling in the 8th house of the natural zodiac is most venomous . The Chart although having some yogas are diluted due to the placement of Fallen Mercury in the 10th house , weak Moon and the Lagna Lord Saturn in Combustion and with Sun. 7th Lord is stronger then the Lagna Lord is another Malefic Parameter , hence Rahul Gandhi may not be able to achieve good results for the Congress Party and the Masses may not like his administration and the Tenure may also suffer .